Paul Cook is the curator of RHS Harlow Carr, the horticultural charity’s most northerly showcase garden. He manages a team of 18 garden staff, 4 students and 4 apprentices, plus many RHS volunteers. How long have you been at Harlow Carr and how did you come to be there? I’ve been here five years. I did my training at Arley Hall in Cheshire and Kew Gardens, went back to Arley as Head Gardener for 10 years and then to Ness Botanic Gardens, near Liverpool. Then I met someone at the Chelsea Flower Show who told me there was a job going at Harlow Carr to develop the woodland. When was the Winter Walk first created? It was created just over 10 years ago to bring a concentrated burst of colour and interest to the garden. 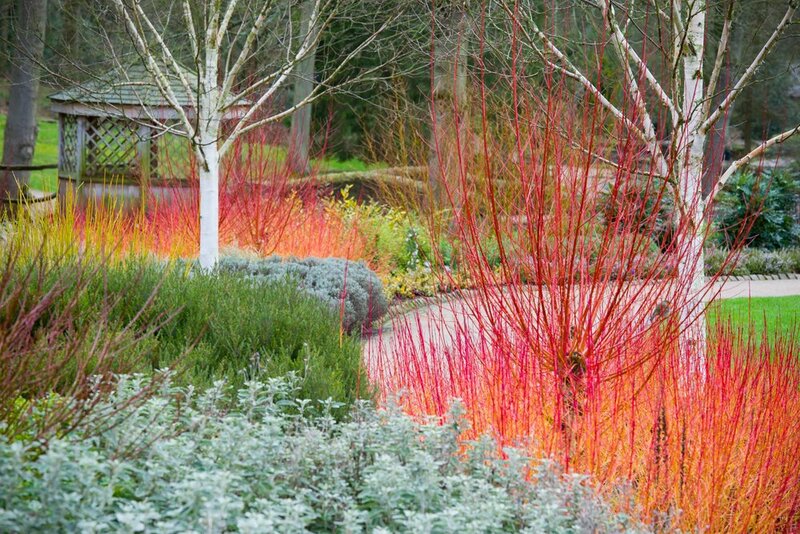 It also shows how the garden doesn’t need to be ‘put away’ for winter and that it can be a stimulating landscape of colour and scent. Does it take much looking after? It’s a great end-of-winter task to prune the dogwoods and willows and we get everyone involved. We have a staggered prune to leave some colour and structure, so some stems are left for two years rather than having an annual cull. What can readers with smaller gardens do to recreate it in their own garden? I’d suggest they try layering their planting – using perhaps a colourful-stemmed dogwood underplanted with bergenia and early-flowering bulbs, such as snowdrops, to extend the season of interest. How is the Winter Walk evolving? The range of plants has extended and we are constantly trying new varieties and plant combinations. Rather than looking to make a specialist snowdrop collection, we’ve added to the snowdrops with a mix of really good garden varieties, such as ‘Magnet’ and ‘S. Arnott’. Both have the RHS Award of Garden Merit, so they’re proven to be robust and reliable. We’ve also tried a range of the Iris reticulata hybrids including ‘Katherine Hodgkin’, ‘George’ and ‘Harmony’, and we’re hoping they reappear, but some can be tricky and don’t flower in their second year. We also have a vole population and they seem to find the flowers very tasty, which is something we didn’t plan for! Several years ago we also added to the daphne collection with new cultivars like ‘Peter Smithers’ and ‘Darjeeling’. How do you manage with a heavy clay soil? We’re on really sticky marlite clay and have sulphurous wells – which made Harrogate a popular Victorian spa town! – that pop up around the garden. We have to do a lot of groundwork before planting, so we dig out some of the clay, add grit and lots of compost. We’ve also found that the topsoil just washes away so adding lots of compost is crucial. We’re also in the process of reinstating the ditches in the woodland to help with draining the site. Any special plans for this winter? We have about 30 acres of woodland here and five years ago we set about clearing sections to give us opportunities to add more winter colour in this area. We’ve already planted lots of bulbs, but the plan is to add lots of winter-flowering shrubs to create a fragrant winter walk through the woodland. Some shrubs have gone in already, but we’ve got another big planting session this winter, when we hope to add another 1000 plants.